We’ve been a sailing family since the early 1960s. My dad’s first sailboat was a single sail ‘Sea Snark.’ The Snark was a small Styrofoam boat…similar to a Sunfish, but not nearly as sailable. We bought it for $50 from a guy down the street from our house in East Islip, NY and carried it home. We were so happy… our first boat! I helped my dad fiberglass it to keep the Styrofoam from falling apart. We’d carry it on top of our 1959 Studebaker Lark down to the Connetquot River for launching. 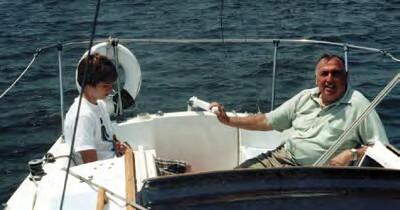 The author’s father, John Mannoia, steers Queen Mamie Too while his son Taylor trims the mainsheet. My dad, along with my uncles Jim and Artie, flipped the Snark one windy day when they ventured into the open waters of Great South Bay. The mast fell off and Dad, in frustration, gave the boat to the kids that rescued them. Our next boat was a 19-foot wooden Cape Cod sailboat with a monstrous iron centerboard. We had this big, heavy crank that would ratchet the centerboard. I swear that was the hardest crank I’ve ever turned but I would never tell Dad it was too hard. I’d crank with all my might. Dad named this boat The Queen Mamie after my mom, and she proved to be a great sailing sloop. With her iron centerboard, we could handle just about any wind the Great South Bay would throw at us. The Mamie was a very strong, old-fashioned wooden boat. We’d sand, chip, grind and chemically treat the bottom to try and remove the years of Red-Lead paint on the bottom. Dad, always the scientist, put fiberglass on the Mamie to help make her watertight. It’s a wonder we’re still alive after chipping all that lead paint and handling those toxic chemicals. The Mamie was a wet boat, and my mom bought us all kinds of foul weather gear. We looked like real sailors. Sometimes I’d freeze being wet with the wind chill, but it was the time of my life. I loved sailing with Dad. We’d sail over to Fire Island and beach the boat on the shore and go exploring. My Aunt Mary bought a summer house at the beach in Saltaire and we’d sail over to visit with her and my uncle. We’d beach the boat in a cove called Clam Pond. That boat earned its keep in clams and fish. We’d bring garbage pails and fill them with clams or fish, then go home and eat. We’d always have a house full of people and being Italian, we knew how to eat. My dad eventually and traded Mamie in for a 22-foot Rhodes Continental, the Queen Mamie Too. For us, it was a big beautiful boat, but in reality it was one of the prototypes and the builder hadn’t worked out the kinks. We were able to sleep four people comfortably in the cabin and two outside. We’d bring sleeping bags and a Coleman lantern and camp out for the night. Life was great. Once, when my mom came out (we’d call Mom the Chicken of the Sea because she was always afraid) we slept over at the beach. The night was calm, but Mom refused to sleep in the cabin. She spent the night half asleep outside in the damp overnight air. Mom wasn’t into sailing. Dad kept experimenting with new ways to improve the boat. Some ideas worked better than others. The Mamie Too had a very light bottom, and Dad built a custom rudder and a centerboard that he filled with about 600 pounds of lead. One day, I lost steerage and control. It looked like we were being followed by a 6-foot shark, but it was really half of the centerboard. It had split its seams and we were dragging the casing alongside. Pretty funny. The Mamie Too was fast in a light breeze, but if it started to blow she was hard to control. She was big and wide, but didn’t have enough bottom to stand up to the wind. I used the Mamie Too as a clam boat and she helped me get through one year of college. We dug a lot of clams and caught tons of fish – she earned her keep. I flipped her in a thunderstorm; I think it was in the summer of 1980. That was one of the worst days of my life. My young son Richard, only 4 at the time, was trapped in the cabin and was standing on the ceiling. I swam under the boat and came up into the air pocket in the cabin to save him. We had to go under again just to come up outside. I don’t wish that on anyone. I met my wife Denise in the summer of 1988. I fell in love with her; she fell in love with sailing. Yes, the Queen Mamie Too was a great boat. She was stolen in the fall of 2005. Some kids must have taken her out of the marina during a nor’easter. When we found her derelict hull, her sails were torn, shrouds and rudder broken off. There was nothing left. I sold her on eBay to a father and son from Kentucky. They were lake sailors. Best of luck, Queen Mamie Too. We spent the summer without a boat (my first boatless summer in nearly 40 years) and bought a little motorboat and trailer in the fall of 2006, The Only One. We used The Only One for the fall, caught some fish and took her over to the beach. Not being motorboaters, we sold her on eBay the next spring. We live in Fleming Island, FL now and sail a Morgan 27. Sailing is in my blood, but I learned what I know from my dad. Rick Mannoia sails on Florida’s St. Johns River and has fond memories of sailing on Long Island’s Great South Bay.